Recombinant monoclonal antibody to CD40L. Manufactured using AbAb’s Recombinant Platform with variable regions (i.e. specificity) from the hybridoma hu5c8 (Ruplizumab). Specificity: The antibody binds to CD40L with an IC50 of 0.845 ug/ml. Application Notes: The antibody binds specifically to CD40L, a surface receptor expressed on activated T cells which acts as a costimulatory molecule to trigger immune responses. The antibody neutralises CD40L function, as it blocks the interaction between CD40 and CD40L. When injected into cynomolgus monkeys, the original therapeutic antibody was found to have a T1/2 of 531 ± 155 hours. Note on publication: Describes the role of CD40-CD40L interaction in immune responses and pathologies. Also describes the generation of humanized monoclonal antibodies against CD40L and the use of a crystal structure to determine its binding. WB on tissued of various species using Ab00447. 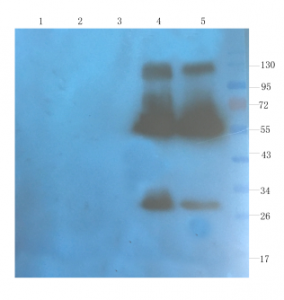 Western Blot using anti-OX40L antibody Ab00447 Rat spleen (lane 1), rat muscle (lane 2), rat bladder (lane 3), human breast tumour (lane 4) and human thyroid tumour (lane 5) samples were resolved on a 10% SDS PAGE gel and blots probed with Ab00447-10.0 at 1 µg/ml before being detected by a secondary antibody. The expected band size (29 kDa) is seen in the human-derived samples, as well as bands corresponding to dimers and other multimers. 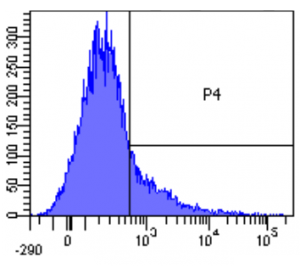 Flow-cytometry on human lymphocytes using Ab00447. 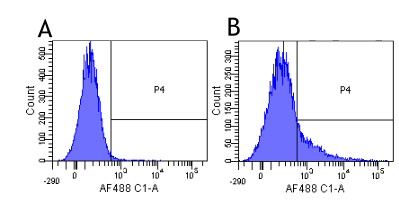 Flow-cytometry using the anti-CD40L research biosimilar antibody Ruplizumab (hu5c8, Ab00447) Human lymphocytes were stained with an isotype control (Ab00102-23.0, panel A) or the rabbit-chimeric version of Ruplizimab (Ab00447-23.0, panel B) at a concentration of 1 µg/ml for 30 mins at RT. After washing, bound antibody was detected using a AF488 conjugated donkey anti-rabbit antibody (ab150073) and cells analysed on a FACSCanto flow-cytometer.